How to make a Wonder Woman Cape! Ever wanted to be Wonder Woman? Well here’s your chance to create your own perfect Wonder Woman cape. 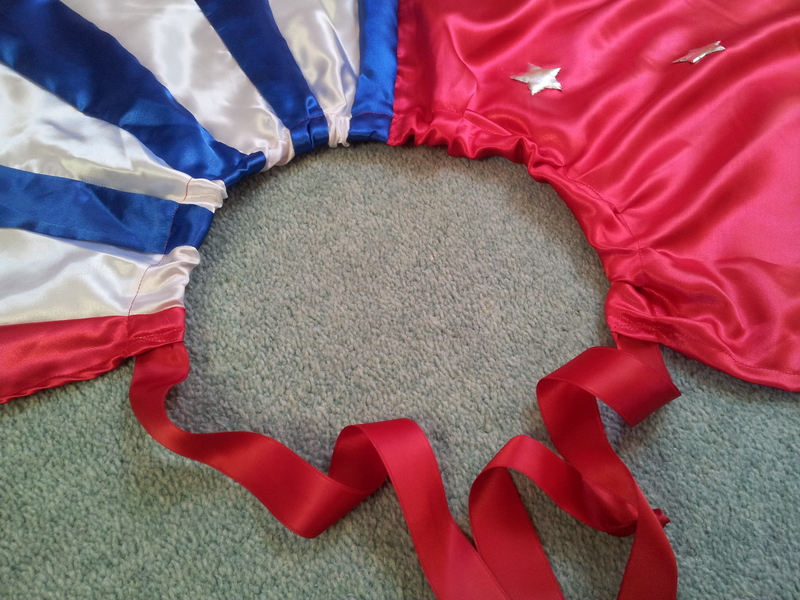 Mine is made from red, white and blue chinese satin (100% polyester), some red satin ribbon for the neck and 10 sew-on fabric silver stars. I used the internet to gain inspiration for my Wonder Woman cape and once I knew what I wanted I drew the design out on paper. 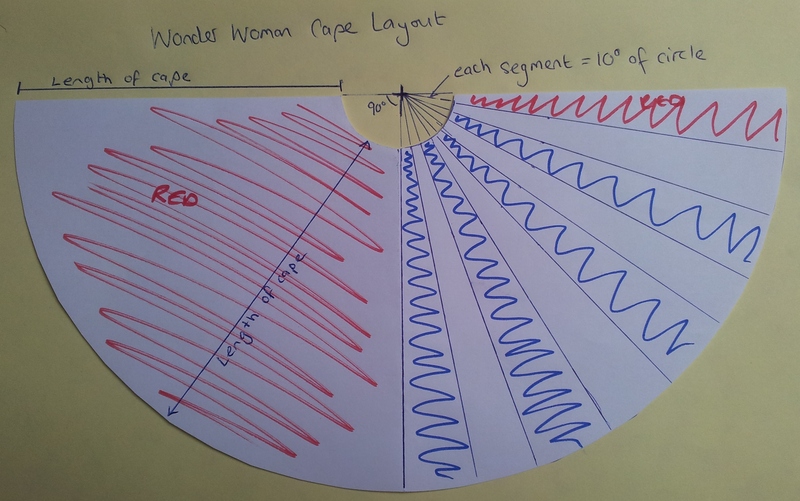 I opted for a half circle cape, with quarter of the circle in red and the other quarter circle divided into 9 segments – 4 blue, 4 white and 1 red. 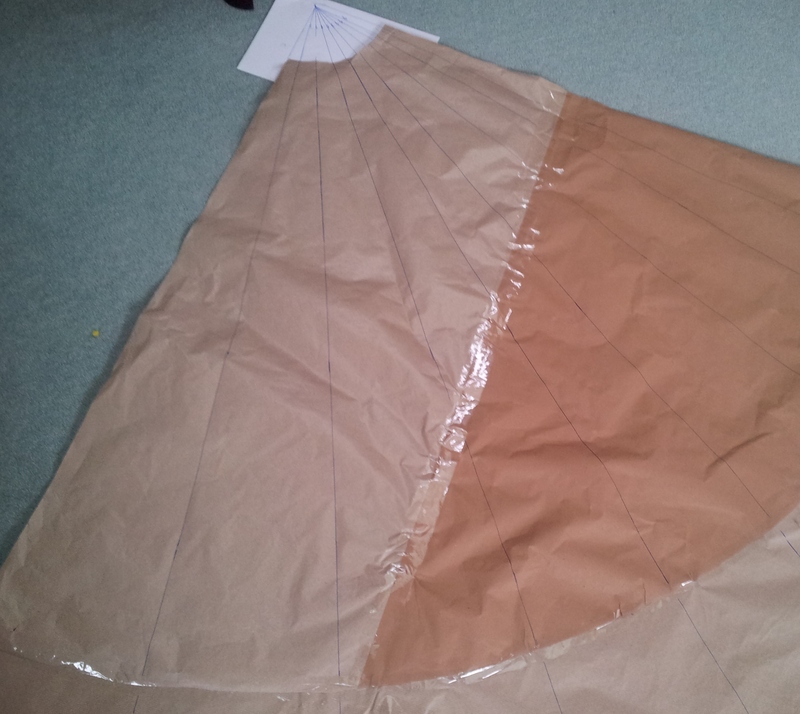 It really helps to make a full size template / pattern too – I used some brown parcel paper for mine. As all my pattern pieces were the size I wanted my finished cape to be I added on a seam allowance before I cut the fabric. To make your pattern, you will need to decide how long you want your finished cape to be. 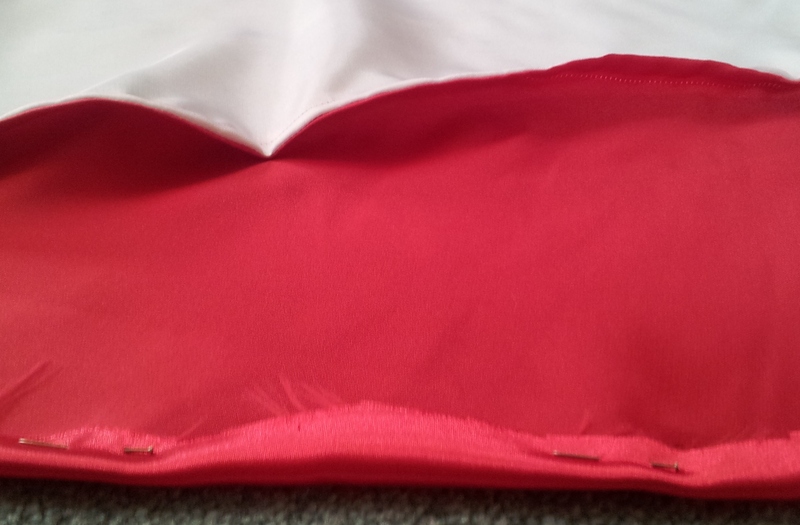 As I didn’t want a join in the middle of the main red panel the length of my cape was governed by the fabric width. With a fabric width of 160cm, drawing a semi-circle with a 150cm radius (using a piece of string and pen) enabled me to have the luxury of 10cm for seam / hem allowances. For the neck, draw a smaller semi-circle with the string and pen. As I wanted my cape to sit on my shoulders, rather than fit snuggly round my neck, the radius of my second circle was 13cm. 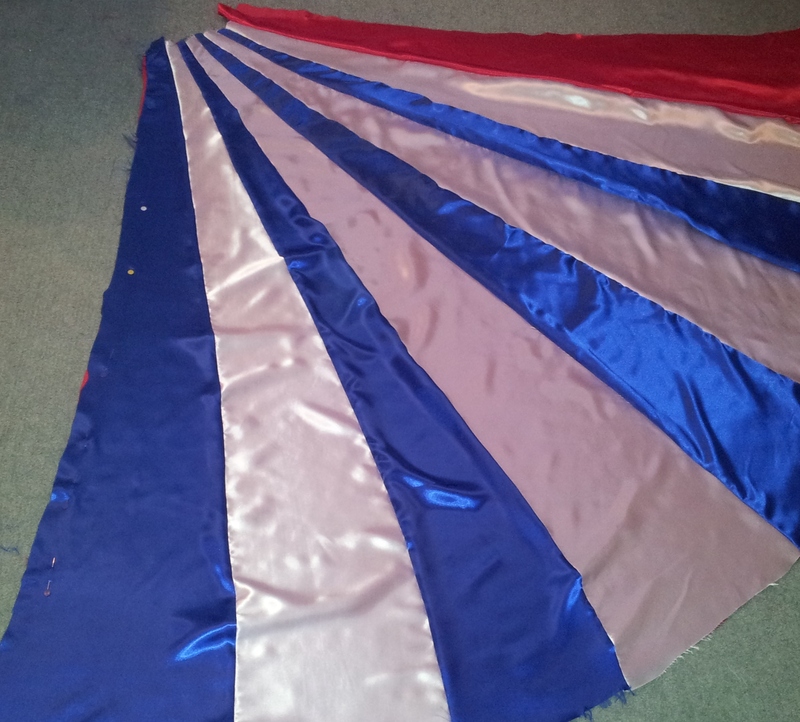 Working on these measurements, this meant my finished length of cape would be 150cm – 13cm = 137cm – enough to cover the bits I wanted to hide but short enough to be able to dance the right away! Divide your semi-circle in half (to give you a quarter of a circle) and your first pattern piece is ready. 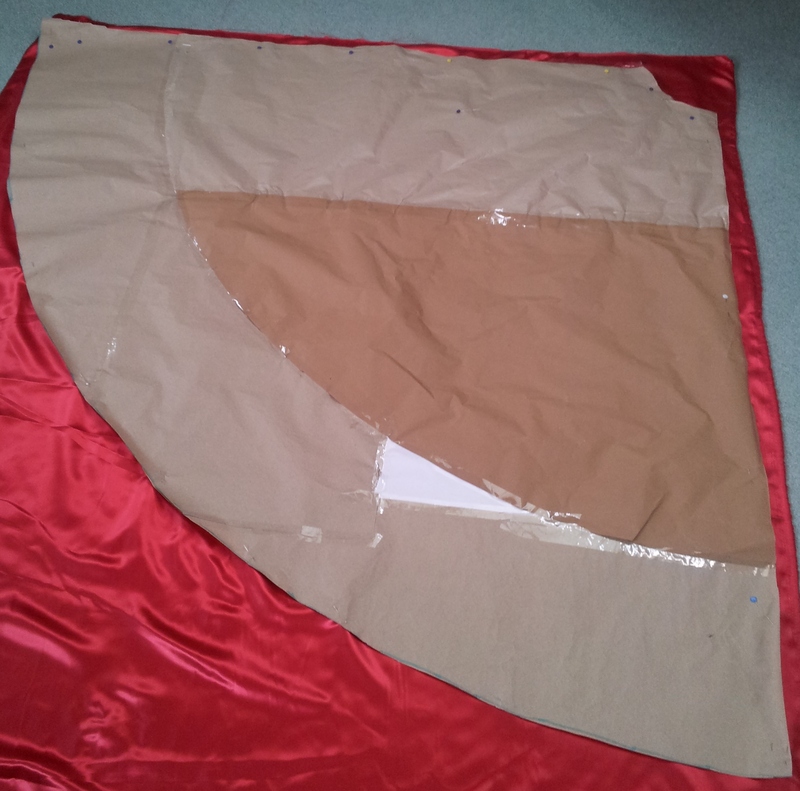 Place your pattern piece onto the wrong side of your red fabric and cut round it – remember to add in a seam allowance! For the other half of your cape pattern / template, divide your second quarter circle pattern piece into 9 equal segments using a protractor. This should be pretty easy to do as there are 90 degrees in a quarter circle – 90 degrees gives you 9 x 10 degree segments. Cut out your pattern piece segments. Lay your pattern segments onto the wrong side of your fabric – again remember to add a seam allowance. 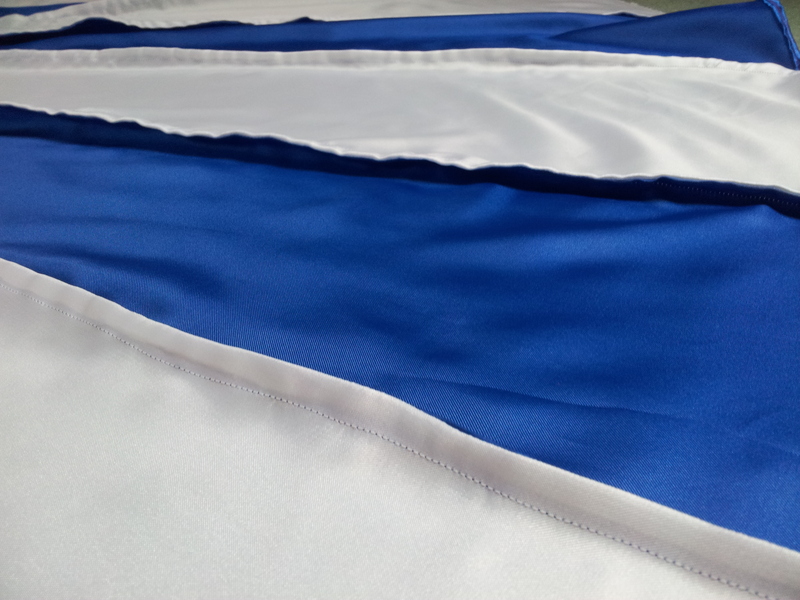 Continue cutting our your fabric until you have 4 segments in white, 4 in blue and 1 in red. 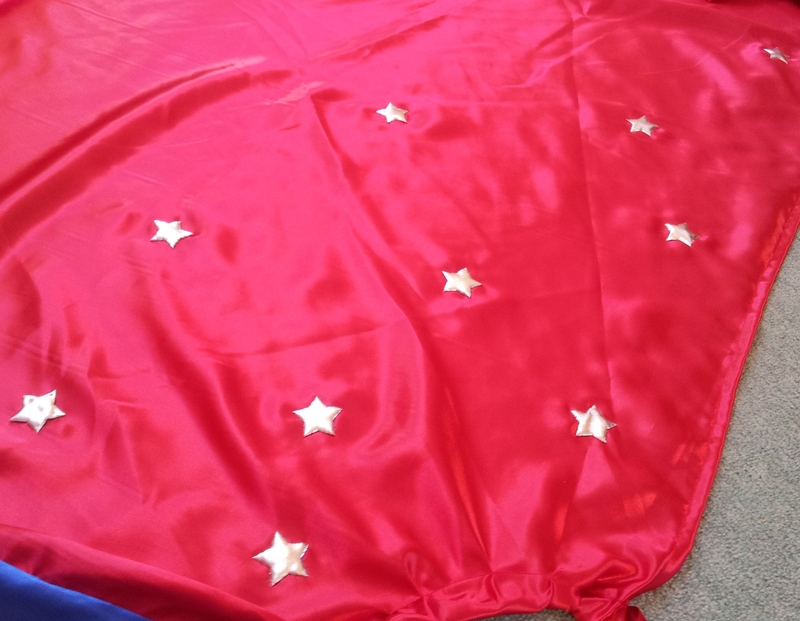 Lay your pattern piece out on the floor to check you are happy with the design of your Wonder Woman cape. It’s now time to start stitching! 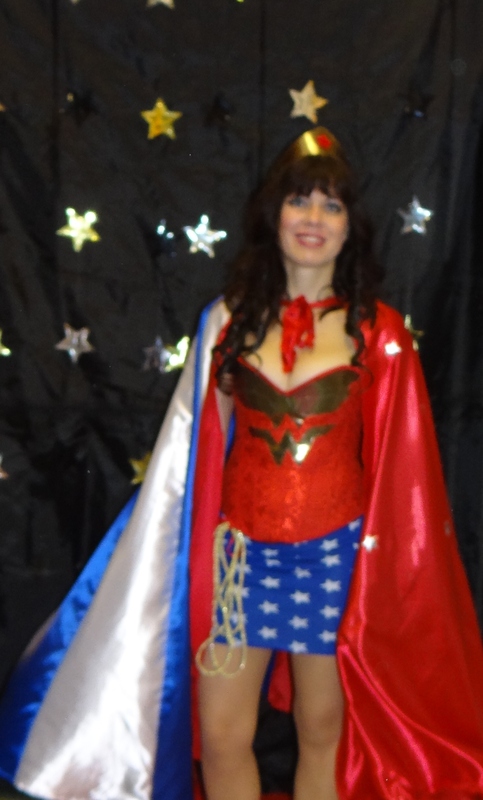 As I wanted the design of my Wonder Woman cape to be seen from both sides I left it unlined and used French seams to join the fabric and hide the raw edges. If you need a quick reminder, French seam are made by first placing the wrong sides of the fabric together and stitching a seam 5mm from the edge. Next, trim your seam allowance to 3mm. 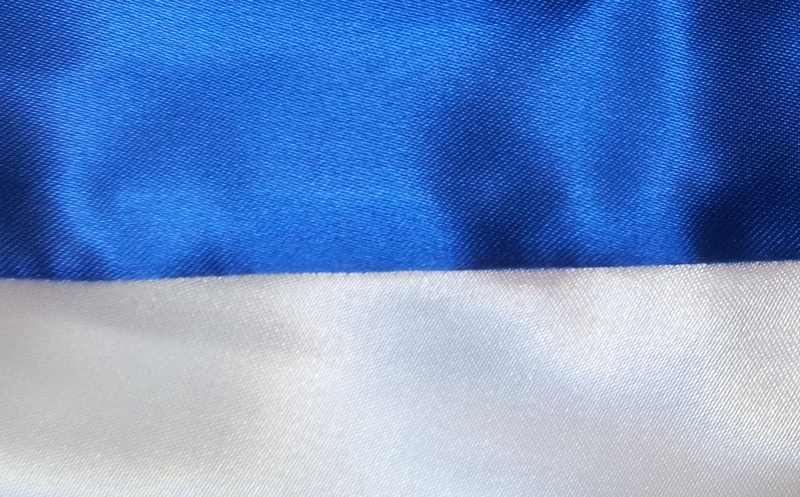 In this photo below, I’m joining a blue and white segment together. Fold your fabric so the right sides are together and press flat. Sew a seam 1cm in from the folded edge. Your finished French seam from the right side. And from the wrong side – the raw edges are hidden inside the fabric. I love the French seams decorative ridges – especially for cape making as it reminds me of wings! Once you have joined together your 9 panels, join the two quarter circles together with another French seam. Neaten your capes red edges with a double hem. To finish the neck, create a channel around the edge for your ribbon to go through by making a large double hem. If you need a reminder how to make a double hem, just let me know and I’ll make a post! Thread your ribbon through the channel and lightly gather the fabric. 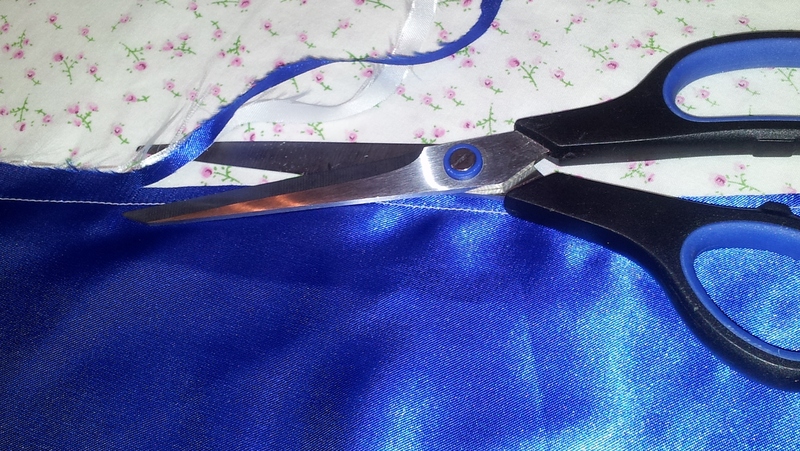 To stop your ribbon pulling out stitch it in place along the seam where your two quarter circles (blue and red fabrics) meet. 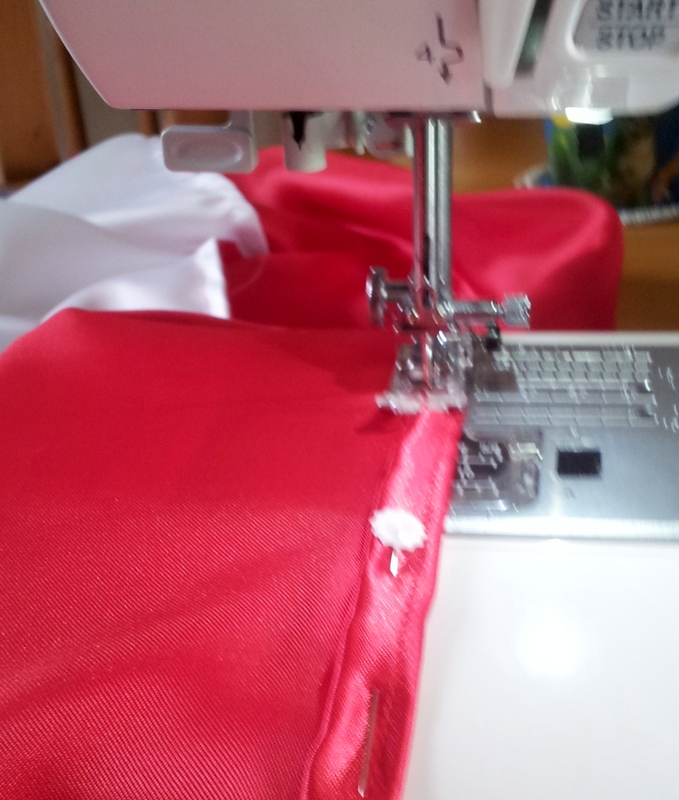 Neaten the bottom edge of your Wonder Woman cape with a double hem. 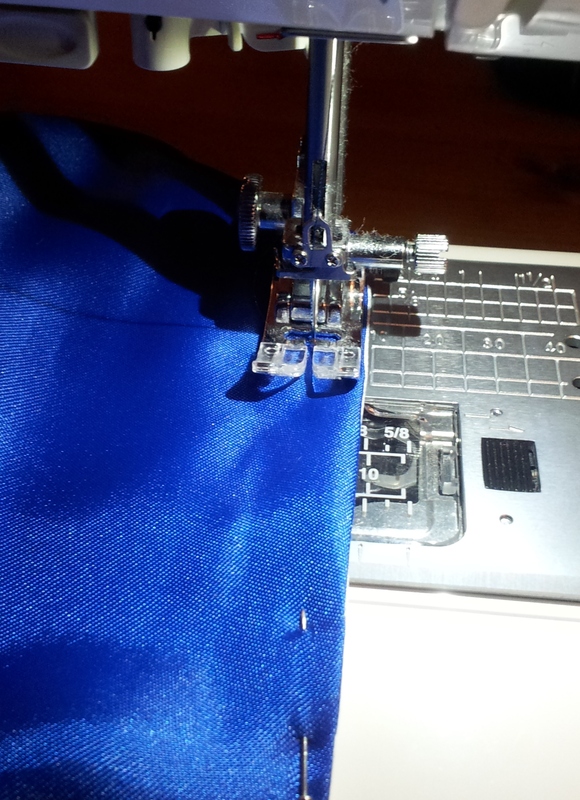 As you will be sewing across all your colour panels (red, white and blue) its best to used a clear ‘invisible’ sewing machine thread. Hand stitch the silver stars and Voila! 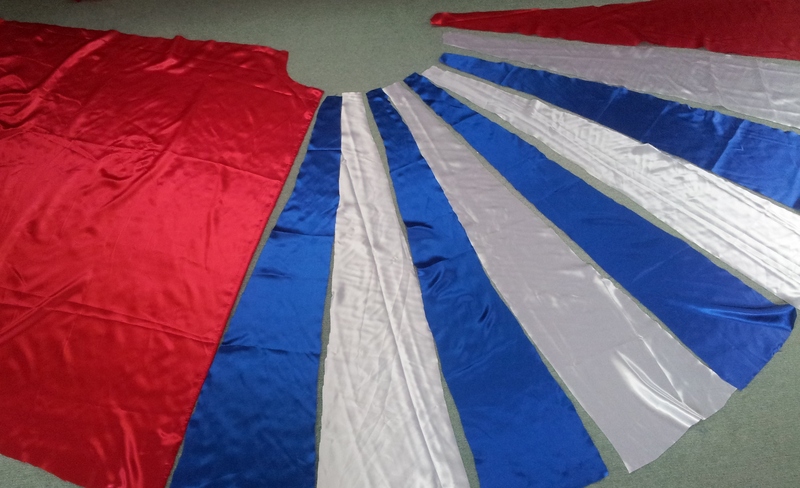 Your Wonder Woman cape is finished! P.S. Don’t forget that spin! 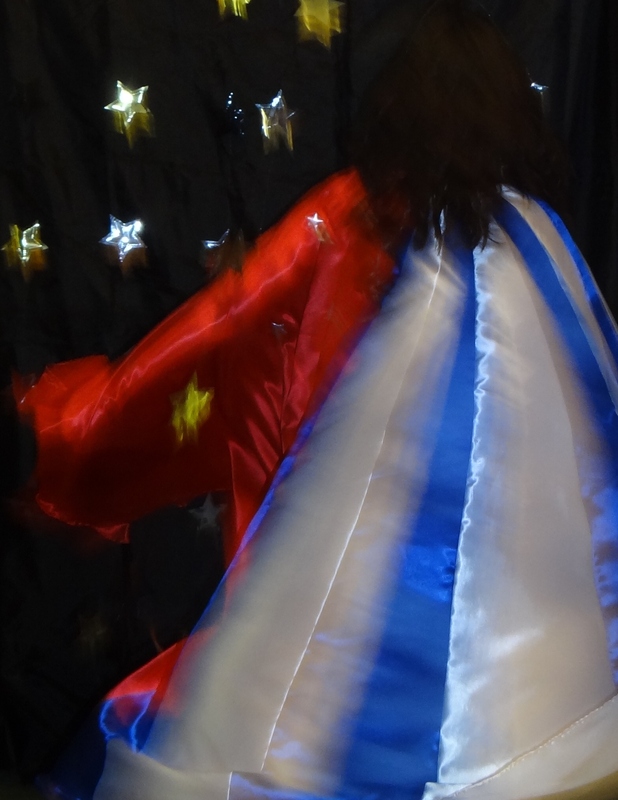 This entry was posted in Beginner, How to guide, Sewing, Stitching and tagged French seam, how to make a fancy dress cape, How to make a half, How to make a Wonder Woman Cape, semi cirlce cape, step by step cape making guide with photos, the stitch sharer, thestitchsharer by thestitchsharer. Bookmark the permalink. This morning I found this page and was so excited because my daughter is going to be Wonder Woman for Halloween. I’m kind of winging the costume, and this cape idea was perfect since I wasn’t sure how I was going to make that part. Thanks for sharing! I was just wondering if you are considering selling this or making another one to well. I’m glad you love the cape – really sorry but at the moment I’m not selling the “her” as she has special memories from my 40th party. Why not have a go at making one? Great, easy to follow pattern. But how much fabric of each did you start out with? 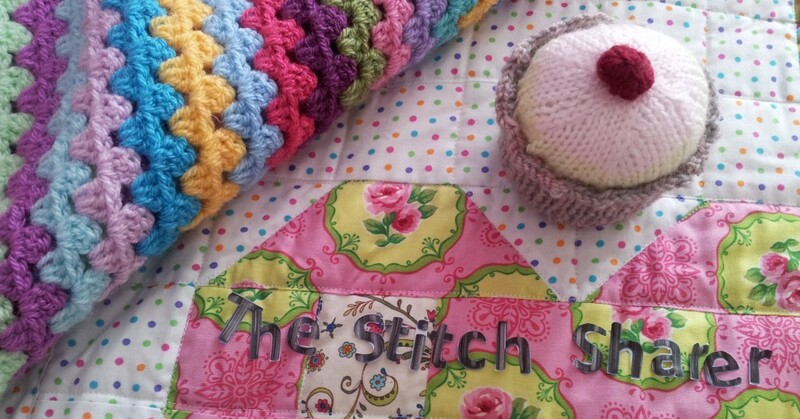 Glad you liked the pattern – unfortunately I can’t remember how much fabric I used…. I normally buy too much just incase I need to start again! Is it the same length from every angle ?? Thank you. Yes, each segment is the same length from neck line to base. Hi, your information has been very helpful. May I ask what color blue you use? I bought some Royal Blue, because Navy Blue looks too dark. Is there any other shade of blue I should use before I sew this together? Lol!! Just awesome! Love It! How cute!! I was just thinking about super hero capes the other day! Thank you! My friend is coming round tommorrow as she want to learn how to make a Red Riding Hood Cape – so hopefully I’ll be able to write a post for that one soon too! What a great costume! I remember making a Wonder Woman costume when I was twelve, I think it’s time to revive and update…thanks for the instruct! Thank you. It was great fun to wear and make! Brilliant – but what was the occasion?